Tenor Carmelo Sorce performs at the 2018 Human Rights Hero Awards in the Teatro Gerolamo in Milano. Every year, Youth for Human Rights Italy holds its annual Human Rights Hero Awards and 2018 was no exception. This time the prestigious event was held at the Teatro Gerolamo, near the famous Duomo di Milano cathedral. It opened with a stirring performance by Italian tenor Carmelo Sorce. The event was sponsored by the Lombardy provincial government (Milano is its capital), the North Italy League of South American and Caribbean Consulates (representing 38 consulates), the Embassy of the Democratic Republic of Congo, the United Planet Foundation and the Church of Scientology of Italy. Coinciding with the International Day of Africa, one of the three awards was bestowed upon Cristina Fazzi, a medical doctor who has been working in Zambia for 18 years helping those in need. Gianfranco Ranieri, a Rotary Club member, was the second awardee. An active humanitarian since 1979, he has directed an organization that has built schools in Kenya to help more than 15,000 kids. The final award went to the Rock No War Foundation, led by its President Giorgio Amadessi. The group aims to bring help and joy to areas that are underdeveloped and in poverty due to war. They have carried out projects on five continents. The news of the newly anointed Human Rights Heroes ran on national news media channel TgCom 24, encouraging others to take up the cause of human rights advocacy and education. 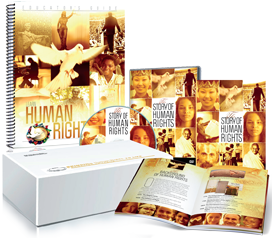 Our Human Rights Education Packages are available at no charge to educators; here is what they say about the materials. The kit arrived and I love it. It is incredible and makes it possible for children to have an interest in learning and to discover their rights in a fun way. It also enables the construction of a critical and active citizen in society. I am writing to thank you for the fantastic Youth for Human Rights package you sent me. I must say it is so wonderful and you and your team are doing great work. I want to thank you again for the package, especially the DVD which I have found so helpful. I showed the videos to my family members, friends and college mates who responded very well. Since a big portion of my world consists of education, I find your educational kit very useful. Especially when it comes to educating youth. 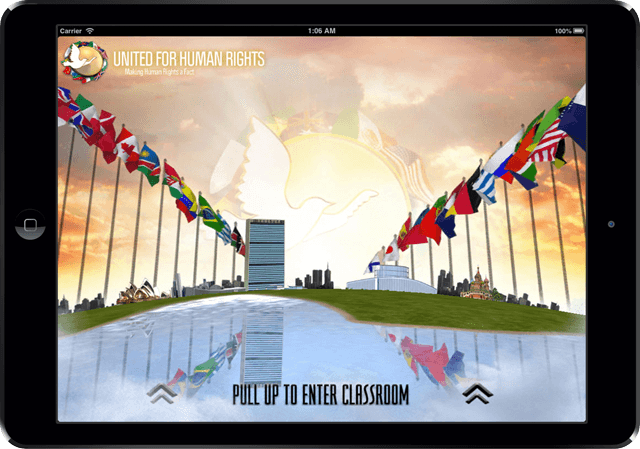 I try to cover human rights in all my talks and lectures. I have found that even when I speak of the Swedish legislation on discrimination in the workplace to corporate leaders, it is useful to talk about human rights. It brings context to why we have laws to regulate discrimination. Thank you so much! My students are beginning to tell their teachers about what they are learning in my Youth for Human Rights Friday Club. I’m so excited about the impact that this curriculum is having on my students. One student, who misbehaves because it’s cool, is now participating in the discussions because he truly is starting to care about others’ human rights.